Before we begin this awesome Oracle of the God of Israel and study it in depth, it is important to stand back and look at it from the viewpoint of the eagle soaring in the heavens, the astronauts circling our globe or trying to reach into the vision of the Almighty One. The Lord of hosts will be re-introducing His “Word” into the lives and consciousness not only of Israel, the entire Middle East but the entire world. The land of Israel is the stage for the Grand Finale as all the streams of prophesies that were given to the prophets of Israel reach their final conclusion. At that same time the School of Shammai (Beit Shammai) became the ascendant group of Pharisees who controlled the educational and religious activities of the Jewish people. As the brooding, rigid and isolationist camp of the Pharisees, they began to build up religious “apartheid” walls around the Jews in order to separate the Jewish people from the Gentile world. They were concerned about religious and physical assimilation of the Jewish people into the Gentile world. They developed a theology that despised the Gentiles while the School of (Beit) Hillel sought to open the gates of Judaism to bring the knowledge of the Creator God of Israel and share it with the entire gentile world. It was the Beit Hillel that believed that the Righteous Gentile did have merit to share in the world to come. It was the Beit Shammai who believed that no gentile could obtain the privilege of eternal life, resurrection or could become a participant in the future messianic kingdom. Like their ancestors in ancient Egypt, the Jewish people in this era of rampant priestly corruption descended to the 49th level of personal degradation. It was in this era where the high priest’s office was no longer held by the family of Zadok, the divinely authorized lineage of the high priest of King David. The religious and political governance of Judea was “owned” by the wealthy aristocratic families of the Sadducees. They bought the office of the high priest from the Roman procurators and governors. The Temple of Herod Inc. was the largest and most corrupt money laundering enterprise in the entire Roman world. The most famous of these Sadducee families was the House of Ananus. It was Ananus the Elder who came to rule as the high priest in the year that Yahshua ben Yosef (Jesus son of Joseph), the Davidian prince, came to visit the temple of Herod at Passover in the year of His Bar Mitzvoth in 6 CE. It was the son in law of Ananus the Elder, Caiphas, who along with Ananus staged a trumped up mini-court of the Sanhedrin in the middle of the night to illegally prosecute the charges against Yahshua, the rabbi in defense of the School of Hillel. Jesus proclaimed that he came as an emissary (messenger) of His “Abba” in heaven to restore spirituality to the Jewish people. He was to bring to their consciousness the divine concept of the coming of the “Kingdom of God” by repentance (Tshuva). The House of Ananus also had a “blood libel” against the House of Joseph son of David. After the death of Yahshua, it was the son of Ananus the Elder, Jonathan ben Ananus who became the high priest in Herod’s Temple. It was he who framed Stephen the Deacon of the Hebrew Nazarene Ecclesia (Jerusalem Church in the Book of Acts) and stoned him to death. It was Jonathan ben Ananus (son of Ananus) who authorized the Shammaite influenced Pharisee student, Shaul of Tarsus to persecute the Nazarenes (the proto-Christians) all the way to the gates of Damascus. It was here that the future Apostle Paul met His Lord, Jesus the Messiah, and with Jesus’ instructions remained under the tutelage of the Nazarenes-Hillel-Essenes in Arabia for the next three years. It was then that the Shaul, now the Apostle Paul received a letter of authorization from James, the brother of Jesus, now the leader of the Nazarenes. With James’ letter, Paul embarking on the bold Hillel inspired Jewish mission to bring the message of the God of Israel to the gentile races. At the same time, it was the Apostle Peter who took the Kingdom-Repentance (Tshuva) message of Yahshua (Jesus) to the Lost Tribes of the House of Israel. These were the former Israelites that had now assimilated into the gentile world to such an extent that many of them had lost their own identity. It was Theophilus the son of Ananus the Elder who also became the high priest of Herod’s Temple. During his reign, he cast Peter, John and the other apostles in prison. Under the advice of Gamaliel, the grandson of Hillel the Elder, the apostles were released. According to Gamaliel, their actions would become the cause of their own demise or success. It was later Ananus the son of Ananus the Elder who framed the brother of Jesus, James the Just (Yakov haTzaddik), now as the Nasi (President) of the Nazarene Sanhedrin. He incited the temple priests to stone James the Just, beat his head with the “fuller’s club” and then threw to his body over the walls of the temple to the Kidron Valley below. The Jewish people in the first century CE were like their ancestors, the Israelites of Egypt. They left the land of Egypt in what is called today by the Jews, the forty-ninth state of degradation. For the next forty nine days fleeing on the road towards the mount called Sinai, they daily had to re-learn a new lesson of spiritual sanctification as they embarked on the path of becoming right with their Creator, the God of Israel. These lessons are yearly rehearsed by the Jewish people today in the forty-nine days from Passover to the fiftieth day of Pentecost. The Israelites had to learn to leave behind all the cultural entrapments of Egypt. The “golden calf” of Egypt and the Erev Rav, the “mixed multitude” that came with them out of Egypt had to be conquered and eliminated before they could stand in the Presence of the Almighty One of Israel. Today, the Jewish people are in the process of learning to conquer and eliminate the entrapments of the modern world global assimilation that they call the modern “Golden Calf.” Those that survived the horrors of the holocaust were given their freedom when at the end of the 2300 Hundred Days (years) prophetically told to their prophet Daniel, the National Home of Israel rose out of the ashes of Hitler’s crematoriums. There in 1948, they immediately had to face the five largest Arab nations of their cousins the Ishmaelites that tried to drive them from the land of Roman Palestine. Yet on that day, May 15, 1948, the Land of Roman Palestine became not the Province of Judea but the Land of Israel. 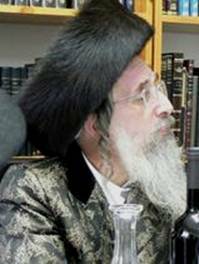 Rabbi Shalom Berezovsky Z’’L, Rebbe of Slonim – “Do not despise the rebuke of Hashem, my son as follows: The rebuke that Hashem gives Israel is, “You are my son—a child of the King! Do not despise yourself through unfitting conduct.” This is the most effective manner of rebuke and the Blessed Holy One used it while the people were still in Egypt. They were sunk in the lowest levels of degradation—the forty-ninth level of defilement—yet the Blessed Holy One called them My first-born (Exodus 4)—a term of endearment the likes of which we do not find anywhere else in the Torah. Through this the Blessed One elevated them to a status that entails responsibility. This is also the meaning of the words that the Blessed Holy One communicated to the people prior to the giving of the Torah. I carried you on eagles’ wings and brought you to me. Where do we see that the Holy One carried the people on eagles’ wings? The intent of the verse, however, is that the Holy One caused the people great elevation by calling them My firstborn son. Through this endearment I brought you to me—to hold close to Me. During the exodus the impetus for this relationship of closeness came from Above. After the exodus, however, the impetus must come from below. As we will learn through the 2006 War between Israel and Hezbollah, the Jewish people are coming into a new awakening no different than the Israelites encamped around about Sinai waiting impatiently for Moses to come down from the mount. He was to bring to them the revelations from the Almighty God of Israel. In their frustrations, they decided to go alone without HaShem their God. With the prodding and assistance of the Erev Rav, the “mixed multitude” from Egypt, they built the “Golden Calf” trying to bring salvation through material prosperity. Today, National Israel, who left Egypt after the holocaust is now again spiritually at the foot of the mount called Sinai. Ariel Sharon and now Ehud Olmert, the last two Prime Ministers of Israel have become recognized by many rabbis to be the last of the Erev Rav, the “mixed multitude.” They can now be seen as protégées of that messianic heritage of Shabbatai Zevi that became foundation for the union of the international banking house of the Rothschilds, the Roman Catholic Jesuit “Illuminate” inspired by Jesuit Adam Weishaupt and the Frankists, the most prominent disciples and heir of Shabbatai Zevi, Jacob Frank. Today, the government of Labor Zionist Israel is fully in the hands of the Council on Foreign Relations in the United States and the Bilderbergs of the European Union. It has been documented by veteran Israeli journalist, Barry Chamish in his books, “Israel Betrayed”, “Traitors and Carpetbaggers in the Promise Land” and “Shabtai Tzvi, Labor Zionism and the Holocaust” that almost ninety percent of the national media of Israel is owned by the Council of Foreign Relations. Up to ninety percent of the military and domestic industry is also owned by members of the Council of Foreign Relations. The problem with the prophets of Israel is that the Jewish people who represented the majority of Israel who voted for the “Last Zionist Government” of Prime Minister Ehud Olmert have sunk to such a degraded spiritual state that they no longer recognize that their legitimacy to the Land of Israel only comes from the God of Israel, not George Bush, the State Department of Condoleezza Rice, the European Union, the United Nations nor Russia. The chastisement of their Lord is now upon them. These were the Jewish people who voted for the expulsion of all the orthodox Jewish Gaza residents at Gush Katif as the sun was setting over the horizon on the 9th of Av 5765 (August 2005). These were the Jews along with Prime Minister Ehud Olmert and his wife who invited the International Gay Pride Parade called the “Impurade” by the orthodox Jews, to the city of Jerusalem. Here they could cast their spell of sexual degradation within “God’s Holy Land,” around the site that the God of Israel calls “His Dwelling Place” in the vicinity of the Wailing Wall of the Temple Mount, up and down the streets of Old City Jerusalem and in the halls of the Knesset of Israel in Jerusalem. This parade was temporarily postponed because of the 2006 “9th of Av War” in Israel. Now today, the War of Israel and Hezbollah that reached its apex on the 9th of Av 5766 (August 2006) when a million plus Jews had fled Galilee, the Jews of the Shomron were still facing immediate eviction from their land and dwellings from the “Fields of Ephraim” in the Shomron or the former land of Samaria had now received the verdict of the World Court of Opinion, it’s the Jews that are responsible for the war and the destruction of the land of Lebanon. At the same time, the vegetative state of their last Prime Minister Ariel Sharon still cast an aura over the Nation of Israel. In the land there was a rumor that there was a pasuk (verse from the Torah) about a “shepherd” that would “die” yet his body would lie near the gates of Jerusalem. 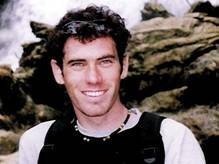 His body would not decompose for many days before it was finally buried. According to the pasuk, as long as the body of Sharon rested near the gates (city limits) of Jerusalem, the enemies of Israel would fear and not attack Jerusalem. On August 13, 2006, the Nation of Israel declared a “cease fire,” imposed by the United States, France, Russia and the United Nations. This “Cease Fire” will allow the Nation of Lebanon to police the land of Lebanon south of the Litani River with Lebanese troops that are imbedded with Russian-Iranian fronted military Hezbollah terrorists. These troops were initially to monitor the northern border of Israel along with 15,000 troops from the international forces from the Vatican controlled former Roman province of France. This may have been a ruse as by August 18, 2006 the promised forces from France began to diminish down to 200. Turkey and Germany backed out but the Nation of Italy, according to Italy’s foreign minister Massimo D’Alema, had now approved 3,000 “peacekeeping” troops. According to Premier Romano Prodi, Italy has been trying to become a major international player to end the conflict between Israeli soldiers and Hezbollah warriors. It now appears that the Vatican will now be able to guard the gates to Jerusalem. The “hand” of God will wait for round two as the “fires of tribulation” begin their refining the “gold” and “silver” and cast away the chaff from the Land of Israel. The water has been tested, the Israeli military was prevented a victory because the people of Israel would not enter into a state of repentance (Tshuva). The “vaulted” military force of the Goliath of Israel is now seen to be vulnerable and conquerable by the Arabs. They will lust to destroy her. The Oracle of Zechariah will wait for the timing of the God of Israel to mark its next deadline. And Damascus its resting place. The God of Israel is now focusing His eyes upon the Middle East. He is looking at one place He wants to be His own and that place is not Jerusalem. So, the ”burden of the Lord” is now upon that place called the “Land of Hadrach.” So we ask, where is the Land of Hadrach? Hadrach is mentioned only once in the TaNaKh (Old Testament), in Zechariah 9:1. Almost all Christian Bible Commentaries will admit that they do not know the location of Hadrach. Most speculate that it is north of Damascus. It has been suggested that Hadrach or Hatarikka (Ḩarrākah) are the same location. 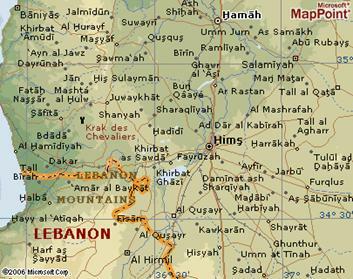 This place lies south-southeast of Hamath and almost directly east of the most northern border of Lebanon and Hims in Syria. Still the evidence is inconclusive. This chapter is also associated with another place with a similar name called Hamath. This city we know was and is in the land called Coel Syria (Land of Syria). According to the partial remains of the battle monument called the Zakir Stele, we learn of the city called Hamath. This stele commemorates the military battle between Zakir, the king of Hamath and Lu’ash against Ben-Hadan the son of Hazael, the kings of Damascus. This battle was located at a place called Hazrack, or Hatarikka. This stele was discovered at Afis in 1907 and kept at the museum at Allepo. 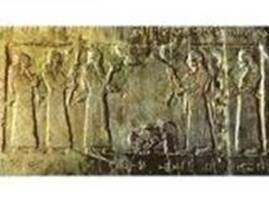 This king called Ben-Hadan from Damascus on the Zakir Stele was a contemporary of the Prophet Elijah and King Joash (Jehoash) of Israel (2 Kings 13:24) about 755 BCE. One hundred years earlier, the “Nimrod” Black Obelisk of Shalmaneser III (841 BCE) gives an account of the king of Hamath called Urhuleni, who was one of the conquered kings along the Orontes River. They were conquered by the Assyrians at Qarqar on 854 BCE. What is of interest to us is that King Urhuleni of Hamath was the ally of the Israeli King Jehu, both of which were conquered by the Assyrians. We even get a picture of King Jehu who is depicted robed with the royal cloth cap. The inscription on the obelisk states: "Tribute of Jehu, son of Omri; silver, gold, a golden bowl, a golden beaker, golden goblets, pitchers of gold, lead, staves for the bed of the king, javelins, I received from him." Flowing north between the Lebanese and the anti-Lebanese Mountains, the waters of the Orontes River (Nahr Al-'asi) begin in Al-Biqa' (i.e., the Bekáa Valley) in central Lebanon along the border with Syria. This gorgeous valley, once surrounded by the famed Cedars of Lebanon, is the home of the Hezbollah insurgent fighters, funded by Iran and ideologically guided by Syria, in their pathological hatred towards Israel. Flowing north, the Orontes River is first dammed at Hims Lake. It then continues its course towards the rich Orontes Valley beyond where it finally exits into the Mediterranean Sea in the Antakya region of Turkey. 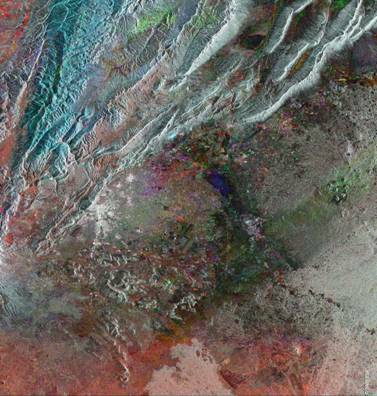 Called by the Muslims, the “Rebellious River,” it gains this name of notoriety because it flows away from Mecca. There on the banks of the Orontes River is a beautiful palace that bequeaths the imagery of the 101 Arabian Nights; the Apamea Cham Palace. Nearby along the river banks are the famed waterwheels that continue to use the irrigation traditions of ancient Mesopotamia. According to the late Archeologist Earnest Martin in an article he wrote in 1999 titled, “The Damascus Phase of End-Time Prophecy,” Martin wrote that the Land of Hadrach is the entire area of the Fertile Crescent. Earnest Martin - These six chapters (Zechariah 9 to 14) can be called the "Damascus Prophecy," but the divine oracle itself was directed to what is called "The Land of Hadrach…" The "Land of Hadrach" answers to the land in the Middle East that was promised to Abraham and his progeny. In a word, it means the "Area of the Fertile Crescent" (from Egypt in the southwest to the head of the Persian Gulf in the southeast, and also including all the Arabian Peninsula). This land is described in the prophecy in Zechariah 9:10 as "from sea even to sea (that is, from west to east which means from the Mediterranean to the Indian Ocean), and from the River even unto the ends of the earth (that is, from north to south which means from the Euphrates River to the end of the Arabian Peninsula).” That was the exact land mass that Solomon understood to mean the "Land of Promise" for Abraham and his children. The reason the City of Damascus is selected to head the prophecy is because Abraham stated in Genesis 15:2 that if Isaac had not been born to be his heir, a righteous Gentile named "Eliezer of Damascus" would have become the one to inherit all his property and the lands promised to Abraham. In Greek, "Eliezer" means "Lazarus," the same "Lazarus" who was mentioned in Christ’s parable of "Lazarus and the Rich Man." 4 Had Isaac not been born and lived to manhood, it would have been Eliezer (Lazarus) who would have inherited this vast territory known as the "Land of Promise." As we re-look at this prophecy, we will concentrate on its pshat, (literal) interpretation. It has been accepted by the Jewish people and the Christians who respect the legitimacy of the Jewish guardianship to the Torah that the prime dwelling of the God of Israel is at Jerusalem. This is the one place on this planet earth that God calls his capital residence. What is less known is that the important starting point in this prophecy is that it is directed “against the Land of Hadrach" because the Lord of hosts is preparing to claim it for His own the lands within the Fertile Crescent. The Land of Hadrach appears not to be a city but a land. Careful analysis suggests that the boundaries of this prophecy of judgment are also imbedded within the prophecy. The starting point of the judgments are “against Hamath” which is recognized by some scholars to be the northern border city in Syria on the Euphrates. Others recognize these regions to be around Damascus that are under the influence of the land of Syria. This would include: Lebanon, Baalbek and the Bekáa Valley, the cities of Tyre and Sidon and may also include the regions governed by the Palestinian Authority. According to Earnest Martin, the “word "Hadrach" means "circuit" or something like the periodic return of the moon (from crescent to crescent). If we focus on the simple language of this prophecy in the six chapters at the end of Zechariah, we would then read the following: "An Oracle Against the Countries of the Fertile Crescent." 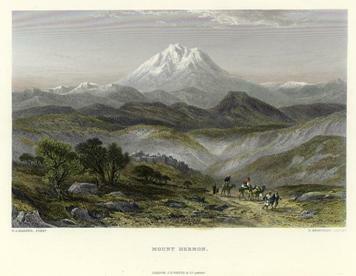 "Mount Hermon" engraved by S. Bradshaw after a picture by H. A. Harper, published in Picturesque Palestine, about 1875. Steel engraved print with recent hand colour. The overwhelming meaning of this text is that the Lord of hosts is laying claim to the regions of Lebanon and Damascus. He intends to reside at Damascus in the area nestled and surrounding the Mountain of Herman on the borders of Syria, Israel and Lebanon. Our first reaction is: we thought Israel was the land in which the Lord of hosts claimed to be His own. That is true. Yet in the King James Version, it calls, “Damascus, its resting place”. Whose resting place will it be? It states it will be the resting place of the Lord of hosts. Other translations call it the “Burden of the Lord” or the “Word of the Lord”. Is God enlarging His region of influence? Is God setting His boundaries in that He will eventually call this land of Damascus His Holy Land? Is the Lord of hosts enlarging His area of influence so that He will eventually reclaim all the “Zions” that once called His dwelling places? If so, then we must then reconsider the fact that there may be more than one, yes, many Zions that the Lord of hosts claims to be His own. The God of Israel is the “King of all kings” and the Lord of all lords.” Without this central fact in acceptance, any dialogue has no common focus of agreement. The typology of earthly kingship is taken directly from the ancient concept that God is the “King of kings” and reigns above all the kings that dwell on this earth. The prime residence of the king is in his capital city. Yet the king (and president) does have other dwelling places such as the America’s official government retreat for the president of the United States at “Camp David.” Yet, President George Bush also has his summer home and official retreat for special international guests at the Texas White House at the Crawford Ranch. The chief dwelling place of the God of Israel is “Zion” in the city of Jerusalem. Yet the God of Israel has other homes or places where God desires to dwell called “Zion.” These areas He gave His glory and divine presence. Moses was now dead and Joshua had assumed command of the children of Israel as they were preparing to enter their “Promised Land.” There in the valley opposite Beth Peor, Joshua repeated the statutes and judgments of the Lord that were given to them on the mount called Sinai. Then the children of Israel began their military campaign. The Israelites did not have UN Observers that were collecting evidence to prosecute them before the World Court at the Hague in order to charge them as criminals of the world’s military laws. There were no CNN reporters giving eyewitness accounts of women and children kept hostage in buildings so that Joshua and the Israelites could be accused of ruthlessly killing women and children. We can assume that the ancient military warriors, with the exception of the Amalekites, had a code of ethics that they did not fight their battles surrounded and imbedded in homes filled with women, children and the aged. Neither did Israel look to a higher national power such as the United States for permission to conquer the kings of Sidon, Bashan and the Amorites. They entered the “Promised Land” with the permission of only one Source: the Almighty One of Israel. Earnest Martin – “We now come to Mount Hermon. Damascus also had a "high place" as its own "holy place" and it was a legitimate "holy mount." The people of Damascus had their own "holy mountain." It was the highest of the mountains from the Euphrates in the north all the way south to Egypt and down to the center part of the Sinai Peninsula. That mountain was "Mount Hermon." It was the greatest of the sacred mountains of the Middle East. It was considered the most holy mountain of the early Hittites, of all the Gentiles of Palestine and even by the Greeks and Romans (see Encyclopaedia Britannica, vol.5, p.876). Even in the Greek and Roman periods Mount Hermon’s sanctity was recognized as the central worship of all the Gods of the world (no matter who they were). Look at this fact. 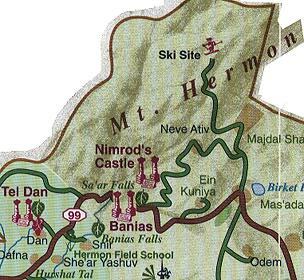 At the bottom of Mount Hermon on the southwest side was a place called Panias by the Greeks after the time of Alexander the Great (it is the modern day, Banias) which was Caesarea Philippi in New Testament times. 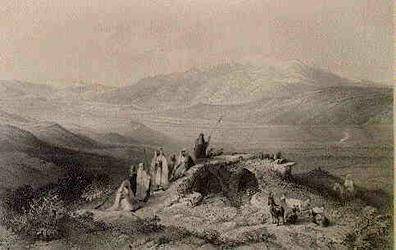 Even to the ancients, Mount Hermon was known as a land of an even greater antiquity. We find in the sixth chapter of the Book of Enoch, it spoke of that day in antiquity in which the “Watchers from Heaven” were sent by God to this earth to instruct the children of Adam in the ways of divine civilization. What is of interest is that the Book of Enoch accounted as one of the most numerous of the manuscripts fragments that were found in the caves at Qumran. If we do consider that Khirbat Qumran (ruins of Qumran) was occupied by the secret ultra-orthodox sect of the Essenes, then we must also reconsider that the Book of Enoch was revered as part of the sacred scriptures to the Jewish Essenes. Mount Hermon, to the ancients, was called the “Gateway to Heaven.” Here the reports of antiquity claim divine emissaries as inter-dimensional beings could be seen moving from one dimension to another. It we take their testimony literally, they could see beings, that they called angels or “Watchers”, appear out of nowhere and disappear as though they were walking through a “star-gate.” Here on this mount called Hermon these “Watchers” entered the environment of this planet earth and then returned back to the heavens. Even before the time of the Tower of Babel in the Land of Shinar (Genesis 11:1-9) the “Sons of God” (Genesis 6) came down to this earth and in their union with the daughters of men procreated the “Giants” or “Titans” of old. 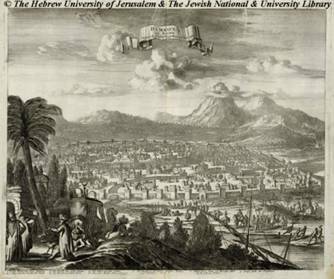 The testimony about Mount of Hermon as the “First Zion” was known from the days of the antediluvians (before the flood of Noah) in the days of the Patriarch Enoch. When the Tower of Babel was destroyed, Mount Hermon, according to Martin, became the most holy place on earth. 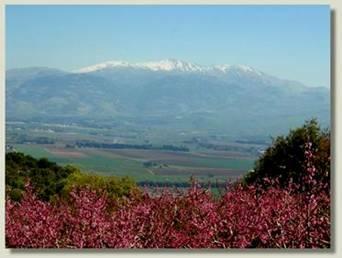 The citizens in the Middle East considered Mount Hermon as a “Bethel,” a house of God. They also considered Mount Hermon as “Zion,” a favorite dwelling place of the Most High God. 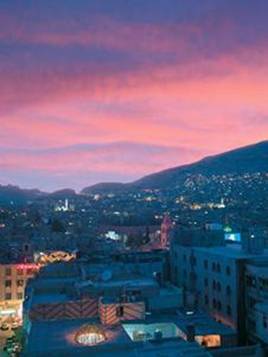 Sitting at the base of Mount Hermon is one of the most beautiful cities of the world, the city of Damascus. This is the site the Lord of hosts has His eyes upon. Besides the city of Jerusalem, the Lord of hosts calls this city of Damascus His own. Yet today, it is a den of terrorists. The “claim to fame” of the international city of Damascus is that it is recognized as “the oldest continuously inhabited city in the world.” Three thousand years ago, it was known to be the capital city of the ancient Aramean Kingdom. Here was the city where the roots of the Aramaic language was first used and written with a modified Phoenician alphabet. Aramaic became the imperial language of the Cyrus the Great’s Achaemenid successors in the Persian Empire. When Alexander the Great defeated Darius the Persian, Damascus became a Greek city and Aramaic lost it preeminence as the international language. 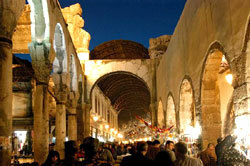 Under Rome, Damascus kept a leading role as the city where the Roman governors ruled the entire Middle East. 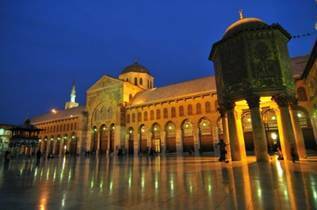 In 635 CE, the city of Damascus fell to the Muslim invaders. In 1200 CE, the city was sacked by the Mongols and during the Middle Ages. Later, it was the Ottomans and the Mamelukes that made Damascus their home. Since the beginning of the War on Terror in the fall of 2001, the American diplomats have been putting considerable pressure on Syria to turn against the infrastructure of terrorist organizations that use Syria as their main operational bases. Assad was handed a blunt ultimatum in 2002 that he close down the headquarter offices of the extremist Palestinian terrorist organizations operating under the guidance of the Syrian military intelligence services. The channel of intelligence command from the President Bashar Assad to the terrorists groups was pinpointed to be Syria’s deputy chief of staff, General Ali Aslan. He was soon retired on January 22, 2002. The noted violent Kurdish Democratic Party called the PKP. The most powerful terrorist organization in the Middle East, a member of the Lebanon Parliament, a government within a government and the largest military force in the land of Lebanon are the Hezbollah, military clients of Iran and Syria. Damascus, the largest and leading city state in Aramea, was the capital of the arch-enemy of Israel, the nation of Syria. Is it not interesting that the first national empire after Egypt that took control of the fate of the Israelites was Assyria; the ruthless military imperialists whose strategy of pacification was to displace all peoples from their homeland and scatter them across the extent of the lands they controlled? 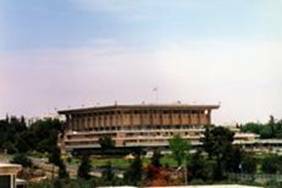 Today Damascus is the capital of the Nation of Syria, the sister Ba’athist Party government to Saddam Hussein’s Party in the Republic of Iraq that was formed with the collaboration of the Haj Amin al-Husseini, the Grand Mufti of Jerusalem in exile and Khairallah Tulah from the Syrian Nazi Party. The leader of Syria is President Bashar Assad, the former president of the UN Security Council for the year of 2002 is in control of the Palestinian terror labyrinth that weaves itself like an amoeba throughout the entire area of Lebanon, Gaza and the West Bank. Asked if Syria feels threatened, Assad again referred to Israel: "As long as Israel exists, the threat exists. As long as there is aggression against an Arab country, and as long as there is a war close to our borders, the danger continues. Anyone who does not worry in such circumstances does not see reality. Worry does not mean fear, but readiness for the confrontation. ...None of us and none of the Arabs trust Israel. It is natural that we should always expect an Israeli attack, even when it does not threaten. It should be known that Israel is based on treachery. This is a point to be considered thoroughly. We are dealing with treachery and threats, which accompanied the establishment of Israel. Since its very inception, Israel has been a threat. It is the Israeli nature, and for that Israel was established. 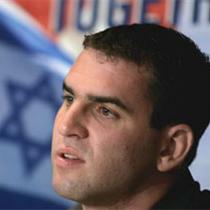 "Based on this understanding of Israel's nature and role, we should deal with the possibility of protracted aggression. ... Israel does not care about the international public opinion. The U.S. is unable to reign it in; to the contrary, the Israelis are the ones who control [the U.S.] now through their lobby. ..."
Yet as a charter member, Syria has remained on the list of the “state sponsors of terrorism” by the State Department of the United States since its inception in 1979. It was first implicated in 1986 with the attempted bombing of an Israeli El Al flight. The Arms Export Amendments Act of 1989 defined Damascus along with any other terrorist states as “those that allow their territory to be used as a sanctuary; provide logistical support to terrorists or terrorist organizations; provide safe haven or headquarters for terrorists and their organizations; plan, direct, train, or assist in activities; and/or provide financial support for activities. For five years, the Syrian government has maneuvered like a chameleon to stay out of the reach of the Western globalist’s War on Terror against the Islamic states of Afghanistan and Iraq. According to the Hichcock’s Bible Names Dictionary, “Damascus” means a “sack full of blood; the similitude of burning.” How appropriate for the city that is known as a “sack full of blood” to be leading the Islamic assault against the Land of Israel in the blood-Red Seal of Revelation. It was the apocalyptic prophet Isaiah that gave another “Burden” or Oracle against the city of Damascus before the days of Zechariah. Some Biblical scholars claim that this prophecy has never been fulfilled. And so it may. Yet even as a ruinous heap in past destructions, it may have been inhabited. Yet for a moment in time, it did cease to be a city when the forces of Tiglath-pilesar “went up against Damascus.” The fate of Damascus was tied to the fate of the tribe of Ephraim and the cities of Aroer that were built by the tribe of Gad to the east of Jordan. As BibleSearchers, it is our prophetic assumption that every prophecy given to the children of Israel and their descendants did have literal application, in part, in the days in which they were prophesied. Yet the final conclusion of all the prophecies of the ancient prophets of Israel will converge into a large river of prophetic fulfillment at the time of the end. Amos 1:3 – “Thus says the Lord: “For three transgression of Damascus, and for four, I will not turn away its punishment, because they have threshed Gilead with implements of iron. Damascus has attacked the modern Nation of Israel in three major wars since her birth in 1948. The first attack by Syria came as the “The War of Independence in1948” when the fledgling Nation of Israel in her infancy declared her independence on the day that the British Mandate expired on May 15, 1948. Immediately, the Arab countries of Syria, Jordan, Egypt, Iraq, Saudi Arabia and Lebanon formed an Arab coalition. Together they invaded the homeland of the newborn State of Israel. 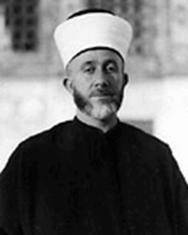 This invasion had one purpose: to declare genocide for the Jews under the mantra, “to push the Jews into the sea.” The leader of the Arabs, who lived in the former British Mandate of Palestine, was Hajj Amin al-Husseini, the Mufti of Jerusalem. He was the military organizer of the Arab wing of Hitler’s Nazi Army and was to have been arraigned for charges at Nuremberg when he escaped with British assistance in 1946. Samuel Katz – "Never in human history can an aggressor have made his purpose known in advance so clearly and so widely. Certain of victory, both the Arab leaders and their peoples threw off all restraint. Between the middle of May and fifth of June, world-wide newspapers, radio and, most incisively, television brought home to millions of people the threat of politicide bandied about with relish by the leaders of these modern states. Even more blatant was the exhilaration which the Arabic peoples displayed as the prospect of executing genocide on the people of Israel ... In those three weeks of mounting tension people throughout the world watched and waited in growing anxiety--or in some cases, in hopeful expectation--for the overwhelming forces of at least Egypt, Syria, Jordan and Iraq to bear down from three sides to crush tiny Israel and slaughter her people." With the Egyptian troops gathering along the Israeli border in Sinai, Syrian forces massing on the Golan Heights 3000 feet above the farms and villages along Galilee, the nation of Israel went into complete mobilization. Egyptian President Nasser ordered the United Nations Emergency Protection forces out of the Sinai Peninsula. The inflammatory Arabic rhetoric shocked the international airwaves. Egyptian President Gamal Nasser (May 18, 1967) – "As of today there no longer exists an international emergency force to protect Israel. We shall exercise patience no more. We shall not complain any more to the UN about Israel. The sole method we shall apply against Israel is total war, which will result in the extermination of Zionist existence." Syrian Defense Minister Hafez Assad (May 20, 1967) – "Our forces are now entirely ready...to initiate the act of liberation itself, and to explode the Zionist presence in the Arab homeland....The time has come to enter into a battle of annihilation." Iraqi President Abdur Rahman Aref (June 4, 1067) - "The existence of Israel is an error which must be rectified. This is our opportunity to wipe out the ignominy which has been with us since 1948. 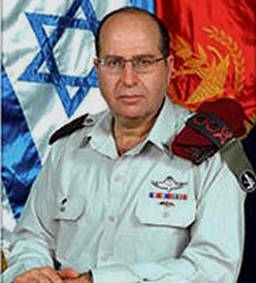 Our goal is clear - to wipe Israel off the map." On June 5, 1967, Israel launched a pre-emptive strike against Egypt. The Sinai sector of the war collapsed and the Sinai Peninsula and the Gaza Strip were captured by Israel. The Nation of Jordan was urged to stay neutral, but also attacked Israel. The final conclusion was that Jordan lost the West Bank and the western side of Jerusalem. When the war was over on June 10, Israel had also captured the Golan Heights and was on the road to Damascus. The third attack on the Nation of Israel by Syria was “The 1973 Yom Kippur War” On October 6, 1973, the nations of Syria and Egypt attacked Israel on a two pronged assault trying to force Israel to surrender the lands she had captured in the 1967 Six Days War. This attack came on the holiest day of the Jewish festival year; Yom Kippur. The Nation of Israel, caught by surprise, was reeling in her human and military losses. On October 17, 1973, Saudi Arabia led the Arab dominated OAPEC (Organization of Arab Petroleum Exporting Countries to call an oil embargo against the United States and any country supporting Israel like the Netherlands. When the cease fire ended on October 22, 1973, the United States and Russia were almost in full confrontation with each other. Israel captured 165 square miles from Syria while encircling the entire Egyptian Third Army on the west bank of the Suez Canal. The premeditated attack upon Israel was only highlighted that on August 23, 1973, six weeks prior to the Yom Kippur War, Saudi King Faisal met with Egyptian President Anwar Sadat at Riyadh to secretly negotiate a pact to use the “oil weapon” against the United States, Western Europe and Japan prior to the military assault by Egypt and Syria on October 6, 1973. 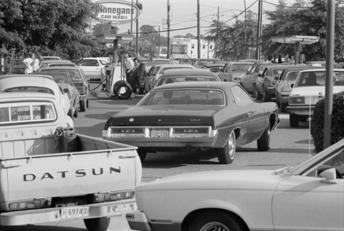 The Oil Embargo against the United States put that nation into an economic recession in 1974 while the American citizens waited in line for hours for gasoline. By 1979, the world price of oil reached US$80 a barrel (2004 prices). I will not turn away the punishment thereof..."
The “judgment” against Damascus then moves over the Land of Lebanon to the Mediterranean Sea. It goes down the Lebanese coast towards Tyre and Sidon. 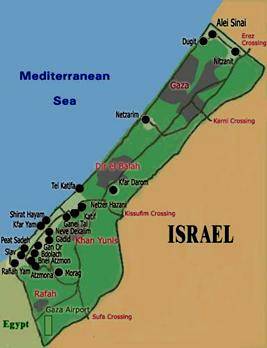 It then moves past the Israeli coastline to the Palestinian regions of influence: Ashkelon, Gaza, Ekron, Ashdod. Then the judgment goes beyond to Assyria and Egypt. What is the Lord of hosts saying? Will He not be dwelling in My house at Zion in Jerusalem? Will the Lord of hosts rather be found “camping” around My house as like David when he went into temporary exile? Has the God of Israel removed Himself away from the approaching satanic “dark forces that will surround Jerusalem at the time of the end? Will this act of God provoke the return of the Messiah and the Battle of Armageddon? Has the Lord of hosts also withdrawn Himself from His own people who have lowered themselves to the lowest 49th level of degradation? Have they done this by allowing the vicinity of His house and His Land to be desecrated by those who hate His Holy Name? Are these Jewish people the ones that the Lord of hosts is withdrawing Himself from the same ones who were willing to bring the “Impurade” (World Gay Pride Parade) into the Land of Israel and also into vicinity God’s very own home in Jerusalem? Rabbi Lazer Brody - “Barely 24 hours ago, Olmert came out with an insane statement that the war in Lebanon is preparation for giving back more Jewish settlements. If that's not enough, today he expressed his willingness to post Egyptians and Saudis on our northern border. Double national suicide or gross stupidity? Olmert is far from from stupid. He's highly intelligent and cunning. But, though it may seem to you strange, from a spiritual standpoint, he and Nasrulla play for the same team - the Sitra Achra, or dark side that opposes holiness. My main lamentation on Tisha B'av 5766 is that Israel as a whole hasn't yet made tshuva and therefore remains in the clutches of dark-side leadership, rather than meriting the leadership of the generation's true tzaddikim. If we all really knew what we were lacking, our eyelashes would fall out from so many tears. Tisha B'Av is a beam of light from within a dark cloud. Our lamentations are designed to connect us to Hashem in a greater bond. And then who is “Him who passes by and him who returns.” Are the nations of the earth who have passed in and out of Jerusalem in over twenty five destructions the emissaries of that former angelic representative of the Almighty to the spiritual world of creation? Is it not amazing that each one of these nations that took possession of Israel, not one of them claimed it as their permanent residence? The 2006 Israeli – Hezbollah War began on the 17th of Tammuz, yet the preparatory entrance to this war began a few weeks earlier. It was June 25, 2006 in the middle of the night, members of the Hamas' Izz al-Din al-Qassam Brigades and the previously unknown Islamic Army came across from the Gaza area. They were sighted on the Israeli army’s electronic screens and an alert was sent out from the tank commander for permission to fire upon them and abort their terrorist mission. That permission never came. 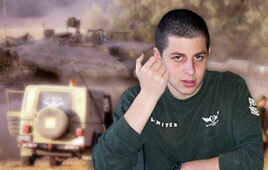 In the aftermath of the Palestinian cross-border raid, 19 year old Israeli, with owl-eyed glasses, Corporal Gilad Shalit was lightly wounded by three shrapnel wounds. He was captured and taken hostage to Gaza in what would be a bid for ransom. Two other members of his tank unit were killed in battle. About three weeks later, on the 12th of July, two Israeli reservists soldiers, Ehud Goldwasser, 31, from Nahariya, and Eldad Regev, 26, from Kiryat Motzkin were abducted in an unprovoked attack by Hezbollah terrorists who entered into Israeli territory and soil along the Northern border of Israel and Lebanon in an intentional raid much like the commando raid along the Gaza border. Both soldiers were students who had been called to service as Israeli reservists, were taken alive, but eight of their military unit were killed by Hezbollah soldiers who were planted to ambush any Israeli coming to retaliate during that day. The capture of the Israeli Corporal Gilad Shalit led to the Hamas demands that all Palestinian women and youth be released from Israeli prisons plus an additional 1000 Palestinians that were incarcerated. The abduction of Reservist Eldad Regev and Yair Goldwasser led to the demands by Hezbollah that up to 9000 prisoners be released from Israeli jail. The renewed confrontation with Hamas in Gaza firing hundred of katyusha rockets led to the first military front of engagement with the Palestinian terrorists in Gaza after months of relative quietness. By July 2, two missiles were fired by the IDF and the office of the Hamas Authority Prime Minister Ismail Haniyeh went up in flames. Hundreds of Israeli shells were fired upon Kassam launch sites and supply routes used to supply or launch the Kassam rockets as they sought to prevent the movement of Shalit’s abductors. The Israeli military offensive called “Summer Rain” began. A day later, in a limited IDF offensive, a house was targeted that was used by the Al Aqsa martyrs’ Brigades, a violent offshoot of the Fatah Organization under the control of Palestinian Authority Chairman Mahmoud Abbas. Nine days after Shalit’s abduction, on July 4, a security sweep in Israel netted eight cabinet members of the Hamas government. This was followed one week after a similar sweep that netted 64 Hamas government officials, located in Jerusalem, Judea and in Samaria. With the government portfolios given to the remaining government leaders, Palestinian Prime Minister Ismail Haniyeh sent his remaining ministers into hiding. Lekarev Report – “Knesset Member Wasal Taha, corresponding publicly with internet surfers on the Arabic-language IslamOnline site, said he repeatedly advised PA terrorists to battle and kidnap Israeli soldiers…According to a report in Maariv today, Taha told surfers on Thursday…"We told them more than once that the Palestinians, who are subjected to murder and ongoing crimes on the part of the Israeli army, have two options: One is to explode and kill civilians - and these are much easier operations. The second option is the military option, in the framework of which a military unit from the resistance [i.e., terrorist infrastructures - ed.] is established in order to break into a military camp, clash with the soldiers and battle them and take them and the conquest into captivity." As the Kassam rocket attacks continued to hit the Israeli town of Sderot located south of Haifa, the Israeli Knesset was in turmoil. The Knesset was not in dissention over how to respond to the military confrontation of the newly elected Hamas government in Gaza. They were not having dissention over how to protect the Israeli public from Kassam rocket assaults upon their homes. They were having a stormy session on whether to allow the World Gay Pride Parade keep its first International meet in the Holy City of Jerusalem that was scheduled to begin on August 12, 2006. The homosexual parade was scheduled to parade down the city streets of West Jerusalem. When mentioned once that it should be changed to East Jerusalem, the Arabs refused, saying that they would kill the participants. The parade attendees were scheduled to visit the Wailing Wall along the Temple Mount and walk down the streets of Old Jerusalem in the public attire of their choice. Other Knesset members considered that the march should be scheduled in Tel Aviv, but Arab and Jewish concerns came with the warning from the religious Zionist public, when Rabbi Yehuda Levin of New York leading the campaign to stop the World Pride anywhere in the Holy Land stated, “"This is a 'measure for measure' affair: If we allow the land to be raped, so to speak, by perverted sexual messages, then, as the Torah says, such Canaanite acts will be punished by having the Land 'vomit you out,' Heaven forbid." Melitzer Rebbe shlit’a from Ashdod – “I briefed the Melitzer Rebbe shlit'a on the latest barrages (of Kassam rockets), only a few miles down the road from here in Ashdod. The Melitzer Rebbe's face turned a bright crimson then paled. With a trembling voice, he quoted the Torah's curse in Parshas Bechukosai of the licentious who break the holy covenant with lewdness and lack of modesty, "I will bring upon you an avenging sword, vengeance of the covenant (Leviticus 26:25)". The Rebbe then told me with fire in his voice, "The immodest and unclad women are bringing this catastrophe on our heads. A woman should know that every tephach (approx. 4 inches - LB) of insufficiently clad flesh creates an angel of destruction. The Hamas and the rockets are the physical manifestations of the spiritual impurity created by Israel's immodest women." The Rebbe then quoted the Code of Jewish Law (Shulchan Oruch, Orach Chaim 75:A) that's based on the Gemorra (tractate Berachos 24a) that tephach b'isha erva, or a tephach of unclad flesh is considered nakedness and therefore strictly forbidden. Benyomin (Ben) Goldin - "All over the Western World fear reigns. The fear of an unknown army of terrorists who have no real identity, an unknown enemy with no face, only one face known to the world - Bin Laden. But how can a whole army fight against one man? How could the whole Western World be afraid of one man? So what have we really learned from all of this? I will explain what you should be learning from all of this: HaKadosh Baruch Hu (The Holy One, blessed be He) is destroying the lie, the false world we've been living in, the excessive, decadent gashmius (reliance on physical things for pleasure and security) that has become our god. God is destroying the false beliefs that security lies in the army, social security, the great insurance companies, a steady job and a big bank account. ...So, my dear Am Yisrael, if you want to save yourselves and the world, renounce the Egel Hazahav (golden calf - LB), its lies, its illusion, and come back wholly to your Father in Heaven. Destroy your false gods and come back! When will you learn? You're not frightened enough. Your hearts are not broken enough. A great selection has already begun. Each Jew, each Gentile, each living thing, will choose a side. Either with man, trusting in man himself, or with God, trusting only in Him. It will be a terrible battle, a very, very torturous fight, but those who hold on to their trust, their love and their belief in God will, with God's help, greet Moshiach (the Messiah). This letter is for every Jew, religious or not. This is the message. This is the truth. A letter from Heaven to tell you explicitly what is expected of you. I bless you all, every single Jew alive today, man, woman, of every age, that all of us together will merit to greet the Moshiach, speedily in our days. Amen. I want to reiterate: there is no time, no time. The world as you know it, the materialistic world as you know it, is crumbling...". Rabbi Lazer Brody - The Melitzer Rebbe knows what he's talking about. I have loads of angry emails asking me why I'm being such an alarmist, or why don't I call for improved modesty and purity in a nice way. That reminds me of an infantry platoon pinned down in a crossfire, and the sergeant yells at the machine gunner to reload faster. "Why aren't you polite, sarge?" Under fire, you don't ask others to be polite. Over here, we're under fire. Amir Oren in this morning's (very liberal and far from right-wing) HaAretz writes that Israel is under siege and the Qassam rockets, "independent capabilities have shown that they can hit the center of Ashkelon, and their ambition will be to strike at the Hatzor air base or at Ashdod and the hundreds of thousands living in nearby cities. The explosive warhead may be replaced by basic chemical or biological agents, which will cause panic. And if yesterday it was Gaza, tomorrow may be the West Bank." Lazer Beams – “LB: I'm not ashamed to trouble you, because if today's message helps even one soul get closer to Hashem, then it's necessary for you to speak up. I often feel that the Tshuva (redemption) movement is taking a step forward, and the religious community as a whole is taking a step backward. Please tell me, why are we losing ground? What's wrong? Ben: It's the Golden Calf. People must put aside their love of the material and transfer it to love of Hashem; there's little time left to do this. Also, there's a lack of tznius (modesty - LB) that tears our people from within. The third problem is of education - people lack emuna at heart (“faith”and a personal relationship with the Almighty that gives meaning to life). They serve Hashem like robots. Hashem wants their hearts. LB: What's the most important thing to instruct them? Ben: Everything is important, but first - modesty and family purity. The opposite is the biggest threat to Am Yisroel today. Ben: The Gay Parade planned for Yerushalayim. This is the real reason I'm allowed to speak, because the evil has become so great and so brazen that Hashem has to allow a small revelation from the pure side. If this tragedy is allowed to take place, and if those people - the lowest and most dangerous order of Amalekites - are allowed to reach the Wall, then no army will be able to prevent the disaster that awaits Am Yisroel, heaven forbid. LB: We've been doing everything to stop this. What else must we do? LB: May we cooperate with the other religions, who are also against the gay parade? 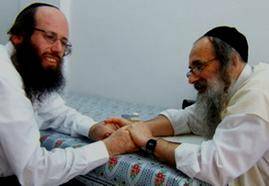 Rabbi Lazer Brody – “It doesn't help us much to tell the Government, "We told you so!" Anybody in Israel with any sense at all is now bemoaning the disengagement (from Gaza). The Army has returned to Dugit, Nitzanit, and Elei Sinai - 3 strategic settlements so critical to Israel's security. People's year-old wounds are being torn wide open again. If the Government would admit their mistake and make tshuva, Hashem would surely help them succeed. Two types of people never learn from their mistakes - the fools and the haughty. That's what scares me about the politicians over here. May Hashem stop the insanity of giving any more Jewish territory and homes to murderers, or to anyone else for that matter. The Land of Israel belongs to Hashem and to His chosen People of Israel. The entire withdrawal and expulsion of 10,000 Jewish residents from Gaza and northern Samaria, ‘was an internal Israeli game that ignored what's going on outside Israel….The Israeli public backed the disengagement because it was blinded and drugged and because it really wanted to free itself from the burden of the conflict and divide the land. But we have to understand that although we are trying to shake the Palestinians off our backs, they refuse to get off our backs and stab us instead. We shouldn't fool ourselves. 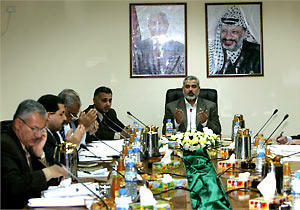 The Disengagement was a strategic mistake of the first order…It brought about the Hamas victory. It emboldened terror groups. It has fueled the Palestinian struggle for years. It created a feeling among the Iranians, the Muslim Brotherhood, and al-Qaeda that Israel can be beaten, that Israel is a society of spider webs as Nasrallah said or a rotten tree as Ahmadinejad said. And therefore the disengagement not only harmed us badly, but also harmed America's strategic war on terror in the region. It created a feeling among Muslim extremists that as it defeated the Soviets in Afghanistan, it defeated us in Gaza and it will defeat us in Tel Aviv. As such, as they destabilized a super power, they will destabilize the west by defeating Israel." Lekarev Report - Prime Minister Ehud Olmert today said he is "absolutely determined" to carry out his planned West Bank withdrawal, despite heavy fighting with the Palestinians in the Gaza Strip. Olmert also ruled out negotiations or a prisoner swap with the Hamas- led Palestinian government to win the release of a captured Israeli soldier, calling the Islamic militant group a "terrorist bloody organization." 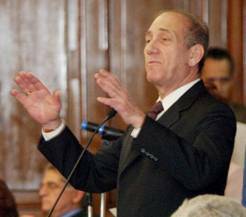 Speaking to foreign reporters, Olmert said separation between Israelis and Palestinians is "inevitable," adding the current round of violence in Gaza won't prevent the establishment of a Palestinian state alongside Israel…Olmert wants to withdraw from most of the West Bank by 2010 to allow the Palestinians to gain independence and to enable Israel to finalize secure borders. "I haven't changed my basic commitment to the realignment plan," he said, referring to the pullout. "I am absolutely determined to carry out the separation from the Palestinians and establish secure borders." The war for the soul of Israel between the God of Israel and Israel’s accuser HaSatan (Satan) and the complete control of God’s Holy Land by the western globalists of the Golden Internationale is now becoming transparent. The War between Israel and Hezbollah brought this fact into virtual reality.